Previewing the Final Four matchup between the North Carolina Tar Heels and the Syracuse Orange on Saturday night. Four keys to Saturday’s Final Four clash between the 32–6 North Carolina Tar Heels, champions of the East region, and the 23–13 Syracuse Orange, the Midwest region champs. 1. Will thrice be nice? It didn't seem likely until the final minute of Syracuse's 68–62 upset of No. 1 seed Virginia on Sunday, but the Orange will get a third crack at North Carolina in Houston. And although it lost the first two games, falling 84–73 at the Carrier Dome on Jan. 9 and 75–70 in Chapel Hill on Feb. 29, Syracuse will not be intimidated by the Tar Heels. The Orange led the first game by six points with 8:30 remaining before North Carolina exploited the opening in the middle of Syracuse's famed 2-3 zone to create several easy baskets for its big men; in the rematch at the Dean E. Smith Center, the Orange had the ball down by three in the final 10 seconds, but Orange senior Michael Gbinijie missed a layup and Carolina sealed the game at the foul line. In other words, Syracuse has proven it can play with the Tar Heels. What it hasn't proven is that it can beat the Tar Heels. If past is prologue, expect a close game on Saturday night. North Carolina's imposing frontline is the best in college basketball, featuring 6'10" All-America Brice Johnson, 6'10" Kennedy Meeks and 6'8" Justin Jackson in the starting lineup and backups Isaiah Hicks, a 6'9" jumping jack who was the ACC sixth man of the year, and 6'11" Joel James. The Orange, meanwhile, have only one player, junior DaJuan Coleman, who goes even 6'9", and he plays just 17.5 minutes per game and averages only 4.7 rebounds per contest. The Tar Heels shredded Syracuse's zone with their big-to-big passing in the Jan. 9 game, as Johnson racked up eight assists, mostly to Hicks, who finished with 21 points. Carolina boasts a +8.4 rebounding margin this season while Syracuse has been outrebounded by its opponents. Add to that the fact that the Tar Heels used their vaunted inside-out attack to shoot an almost impossible 72.0% on its two-point shots in the Elite Eight win over Notre Dame and scored on 19 of its final 20 possessions. Anything resembling that kind of offensive efficiency will likely result in North Carolina moving on to Monday night. It seems like every year there is a debate as to whether or not playing in a dome will affect a team's shooting as it adjusts to the size and depth of the arena. No building has been more harmful to shooting percentages than Houston's NRG Stadium, home to the 2011 Final Four in which the quartet of teams (Butler, Connecticut, Kentucky and VCU) combined to shoot 34.3% from the field overall and 28.1% from three-point range in the three games. This year's field features three teams that each attempt more than 40% of their field goal attempts from beyond the arc. The only outlier is North Carolina, at 26.8%. If the shooting struggles persist for the perimeter-oriented attacks of Oklahoma, Syracuse and Villanova those teams could be in trouble. The Orange, in particular, take 42.2% of their shots from outside, so if they're not hitting it could be a very long night for Jim Boeheim's team. The Tar Heels only make 32.1% of their threes to begin with but because they don't rely on that shot they less chance of it costing them on Saturday. 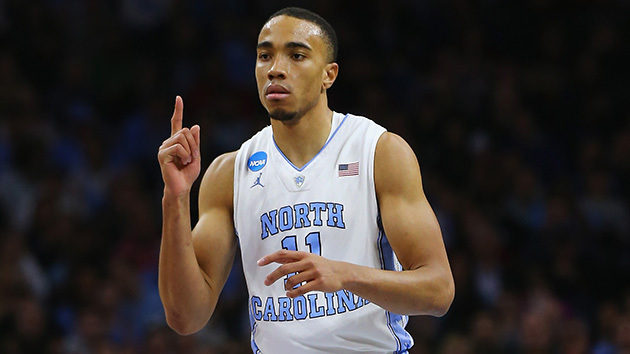 Besides, if Marcus Paige continues his NCAA tournament renaissance in which he has made 13-of-27 from outside, Carolina will be even tougher to beat. The last time Boeheim faced Roy Williams in the Final Four, it came in the 2003 national championship game, in which Boeheim's Orange beat Williams's Kansas team 81–78. Syracuse that day got 50 points from a trio of freshmen: Carmelo Anthony (20), Gerry McNamara (18) and Billy Edelin (12). The Jayhawks, meanwhile, were led that entire season by seniors Nick Collison and Kirk Hinrich, who had 35 points in the final. There's a similarity in this year's matchup, in which the Orange's two best players in Chicago on Sunday were freshman guard Malachi Richardson and freshman forward Tyler Lydon, while the Tar Heels have been led all year by seniors Johnson and Paige. Richardson was named the MVP of the Midwest Regional after scoring 23 points in the win over Virginia while Lydon had 11 points (including a shoeless three-pointer), six rebounds and five blocks. Johnson, meanwhile, was named East Regional MVP after putting up his school-record 23rd double-double of the year (25 points and 12 rebounds), while Paige has averaged 14 points in the tournament and put up 15 assists against only four turnovers.